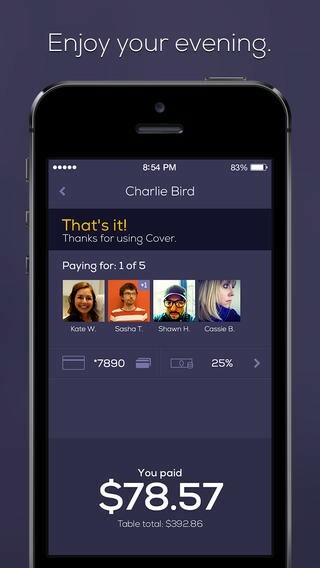 Anyone who’s ever been frustrated while attempting to hail a waiter to pay the bill at the end of a meal might want to try Cover, an app that allows diners to settle their check via smartphone. Eight months after its initial launch in New York, Cover made its Bay Area debut last week, starting with an initial roster of about twenty mostly high-end restaurants, including Daniel Patterson’s three Oakland establishments: Haven, Plum Bar, and the newly revamped Ume. According to Cover co-founder Mark Egerman, the idea behind the app is to make the process of paying at a restaurant as seamless as possible. “Cover is a way for restaurants to provide the best experience for customers — to take the dining experience and make it feel special,” he said, adding that the service was inspired by the popular car-hailing app Uber. Like Uber, Cover stores users’ credit card information and a default tip percentage. Once seated at the restaurant, you check in and alert your server that you’re using the app to pay. At the end of the meal, you can sip your coffee or digestif at your leisure, and then simply walk away. The idea, as Egerman put it, is to make each customer feel like a VIP — “like you’ve been coming [to the restaurant] all your life and you have a personal account.” With Cover, your credit card gets charged automatically, and you never even look at an itemized check. (This, of course, also means you’re trusting the restaurant to get the bill right.) For group diners, the app will split the check — evenly by default, though you can adjust those settings. Egerman stressed that, unlike Uber, Cover isn’t a “luxury product,” and diners don’t pay anything for the service. Instead, the company makes money by charging the restaurants a percentage fee that’s comparable to the processing fees they’d otherwise have to pay to the credit card companies. In an email, Patterson praised Cover as an “easy-to-use” app that he found easy to integrate into his restaurants’ existing payment systems. Cover is one of a handful of mobile-payment systems currently vying to make inroads in the Bay Area. Other contenders include Tabbed Out, which has less of a fine-dining focus, and the online-reservations behemoth OpenTable, which is piloting a restaurant payment app of its own.